50 let? A sem res že toliko star/a? To je vprašanje, ki si ga verjetno zastavi kar veliko ljudi, ko pride do te meje. A leta seveda niso važna. Da le zdravje služi in duša vriska. Ostalo pa si privoščite sami, glede na to, kar vas veseli. - napis je narejen s pomočjo računalnika. This is adorable! Thanks so much for sharing with us, and have a blessed week. Hi hi hi ....a so to lastne izkušnje ali govoriš kar tako? Moje ti bom zaupala čez leto in pol. 50 se sliši veliko, jaz bom raje govorila, da jih imam polovico od 100. Oh... Mojih 50 je žal že mimo. Sedaj so na vrst prijatelji. Letos bom kmalu že na 3 praznovanju Abrahama. Leta gredo zelo hitro . 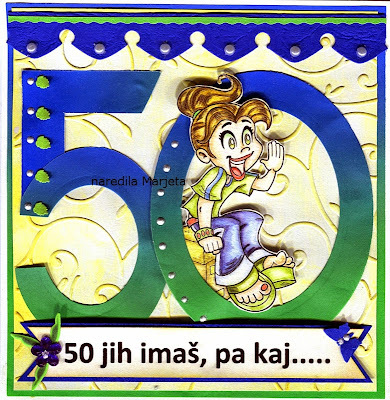 Lahko pa ti povem, da prav nič ne boli, ko prestopiš magično mejo 50 - tih. Sicer pa, star si kolikor se počutiš in jaz upam, da bodo moje baterije še kar nekaj časa polne. Všeč, zelo. Krasni številki si izrezala in sploh je voščilnica polna energije z mladostno petdeset letnico. Super Cute!! Thank you so much for entering our ATG challenge at Through The Craft Room Door this week. Looking forward to see you again next challenge. Beautiful card, love the girl sitting on the 50. Thank you for joining us over at http://lilpatchofcraftyfriends.blogspot.co.uk/ challenge 9, good luck. Fabulous make! Thanks for joining us over at Crafty Calendar this month & good luck! This is a fabulous card, a brilliant image and lovely bright colours. Thanks for joining us this week at Penny's Paper-Crafty Challenge. What a beautiful card and cute image. So delighted you joined us at Word Art Wednesday. A new challenge started today so, I hope you link with us again. Leaving you with God's inspiration in Ephesians 3:16-18 which says, "I pray that out of his glorious riches he may strengthen you with power through his Spirit in your inner being, so that Christ may dwell in your hearts through faith. And I pray that you, being rooted and established in love, may have power, together with all the Lord’s holy people, to grasp how wide and long and high and deep is the love of Christ." Hugs always! So cute that the digi is popping out of there! brilliant! Thanks for joining us at Lil Patch of Crafty Friends Challenge Blog. Spread the word! Our challenge is always anything goes! Good luck! Fab and fun card. Love the image. Thank you for joining us over at the Scribbla and Scrap Challenge. Good luck.